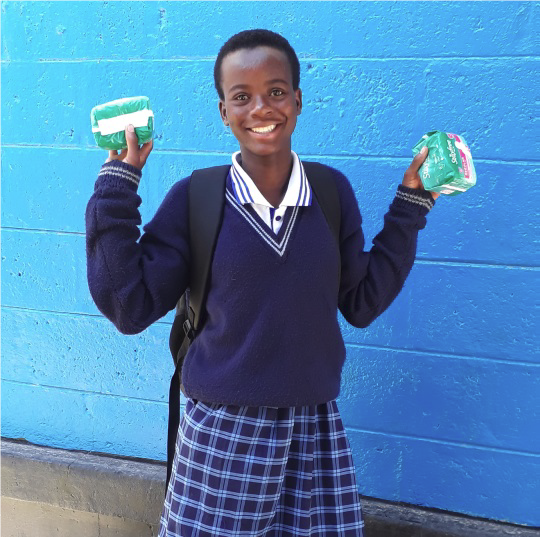 Stella completed the DREAMS mentorship program and was selected for a scholarship of a monthly supply of pads - she has no reason to miss school anymore. “One Sunday morning, while my mother was attending church service, I was sent to sell maize by the roadside. I didn’t feel comfortable, and I knew there was something wrong, so I went home. I rushed to the bathroom to check myself, and I discovered I was bleeding. I didn’t know what to do. I was scared of what was happening to me; it was my first time to bleed. I rushed out and told my neighbor, and she told my older sister. When my mother came home, my sister told her what was happening. My mother bought me a packet of pads but did not tell me how to use them, so I just packed them away. I avoided school, for fear of messing up my uniform and having people laugh at me. But all this changed when I joined the mentoring program under DREAMS. In our group, we talk openly about periods and how to use pads. I learned that if I wear a pad, I don’t have to miss school anymore. We learned everything about menstrual hygiene, and I am now even confident to share what I know and my experience, with others.